Cutting across Plaza Lourdes, one of Bogota’s many pigeon-dotted hubs where shoe-shiners huddle and whisper, policeman drift, and idlers stand and stare, I notice two features of the plaza that proudly stick out from these other ordinaries. First, there is a large, ornate Gothic-Moorish church, Iglesia de Nuestra Señora de Lourdés, which seems to maintain a straightforward, blunt posture toward me no matter which direction I face. 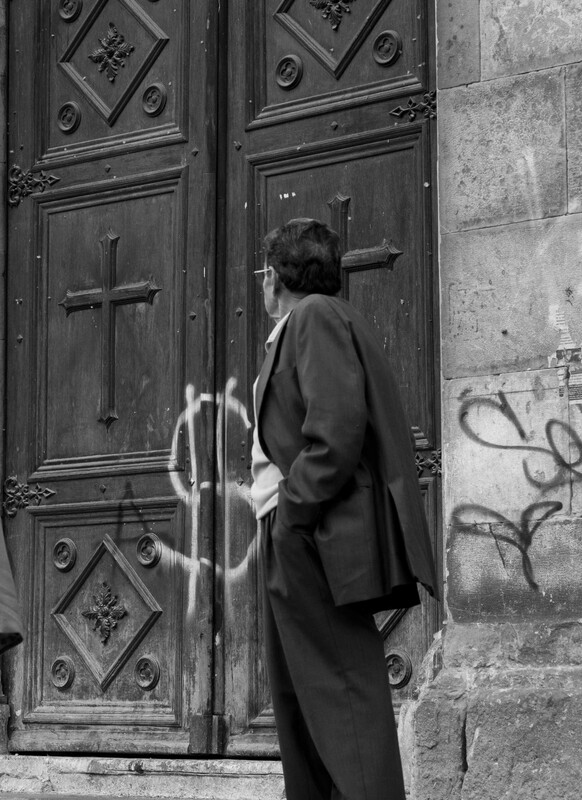 Second, on the front doors of the church there is a gigantic, equally sincere dollar-sign spray-painted, fresh and white, into the defeated wooden doors. The front doors are shut tight. Iglesia de Nuestra Señora de Lourdés was constructed in 1875. Designed by Julián Lombana, the church, which is under what appears to be a forgotten moment of construction, sits in the center of Bogotá’s Chapinero district, where a strong proportion of the city’s lively commercial activity flourishes by day. Up until 1991 Roman Catholicism was the official state religion in Colombia. Then, a wave of constitutional reform granted equal treatment to Colombians no matter what their spiritual choices. It is estimated that some 90% of the population identifies as Catholic. Only roughly 25%, however, practice their faith each Sunday inside dim, quiet cathedral walls like the ones that face me as I pass. Moving swiftly through the plaza with a dossier of documents clutched under my arm, I head for home, where Yudbeny waits to put something on my plate and quiz my mood. But something prohibits my cut across the plaza. In the middle of the flat brick space, there is a large crowd. A circle of shoe-shiners, elderly women, young boys and old men, idlers and passers-by gravitate around someone who has decided to growl and yell something important at the top of his lungs. Everyone is watching intently. I decide to take a look, and what I find is a hefty man with his shirt and shoes absent. The soles of his feet are black. He is yelling passionately. In front of him there is a raggedy blanket, and on top of it, there is a small mountain of shards of broken glass bottles. Next to him, there are more instruments that could only be the utensils owned by a soul of strange habits: a board laden with nails, and a knife whose tip is stuck into the board, as if a cut frozen in time. The crowd watches as the man shakes the glass on the towel and waits for him to perform his act. I, instead of becoming enchanted by the charm of the performer and distracted by the blur of the crowd, decide to take a moment to scan my surroundings. I see no police. That is odd, I register. And then my eyes seize upon it. It is the sort of thing that should send chills through any spine. It runs from somewhere near the top of the left side of his head straight down toward the collar-bone. The cut is deep. It appears freshly stitched and still moist. It runs directly behind his ear. The image is not startling at first, but it grows increasingly grotesque as I hold my stare. Feigning an aware calm, I am totally transfixed on the gash belonging to the head of a young boy that bobs in the quiet crowd one foot in front of me. The young boy is standing close to an old man. Both listening patiently to the yelling voice harmonize with the rattle of broken glass. Surely, it appears that the young boy was the victim of some heinous crime. That is what I think of first. My conscience tells me it was not an accident, but I am in no position to know, and I feel as though I am in a precarious position to ask. For all of the beauty that Colombia owns, today its Plaza Lourdes wears another ugly liability. For a country that tries desperately to dress its wounds, cuts still appear. Later I cross through the plaza again. This time the man with black soles who screams with the sound of shards of glass is gone. The plaza is nearly empty. It is a morning on a Sunday. Then, further toward the church, I notice an old man. He is standing almost directly in front of the front doors. The doors are still shut. The man possesses a wide stance. He wears dark shoes, a suit coat and peppery hair. He appears comfortable and dignified with his hands tucked calmly inside his pockets. And the only thing he does is stare. The old man stares at the doors of the Church of Our Lady of Lourdes and the gigantic dollar sign seared into the mouth of the church – like stitches holding together a once beautiful face, now knotted and ugly. The old man’s stare is fixed and intent. But it is difficult to know why he stares so hard. It is difficult to know if he is watching the doors, saying a prayer to his beautiful church and cursing the scar, or if he is cursing the ugly church and praising those who gave it the scar it wears. Or maybe he has his eyes closed tight, not watching anything at all, thinking instead of how the politics of fighting for the church against the politics of fighting for the dollar have plunged his country into decades of civil war – cutting his sweet Colombia right in two – and how when he opens his eyes, he hopes both the church and the dollar sign will vanish before him. Maybe this is what he wishes. The next day I pass again. The man has vanished. 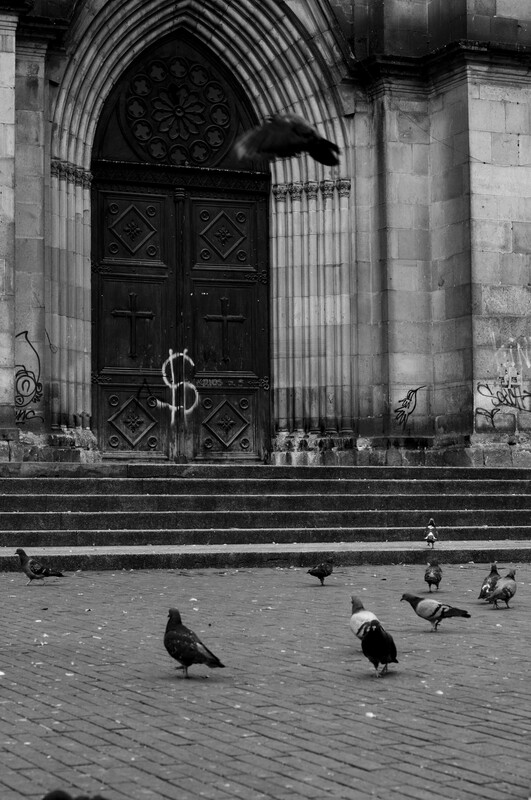 The church and the dollar sign are still there.